A post that came five days late. So I have been missing for yet another two weeks. I have a great lunar new year although the red packet collection has been quite bad. It is time to admit that as I age, the food has become more important than the money. Two more days of break till I get back to work. I still want more off days! I welcomed the quarter of a century of my life with this. Thanks to my lovely friends who spared no effort to prevent me from taking out a single cent. You guys are just too... wonderful!!!! 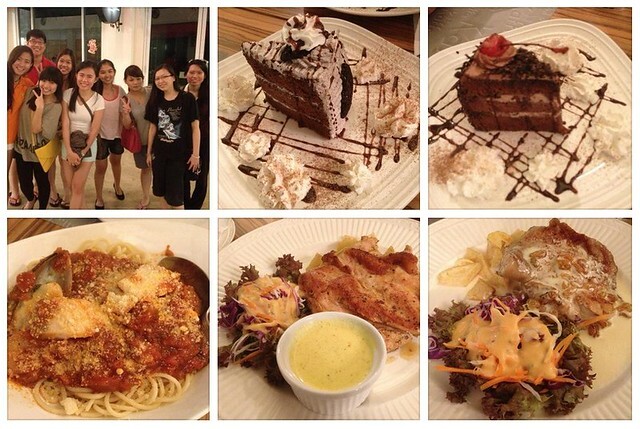 The dinner at Kaffa was so good and I really enjoyed the quality time with you all. Even the photo session with people I don't really know could be so much fun! Do you know why the food seemed to taste good? It is because it was shared, that's why! I would love to write longer but I have been taking too long a break to string more words together to revive this almost soon to be white elephant. If you are still here reading this post, I have to apologise for the long absence. Now that I am 0.25 century old, I thought maybe I should continue penning down my extraordinary moements of my ordinary life. This is the first post of 2013 so a very happy new year to everyone!! Let's pretend that new year only begins on my birthday.